The ISS Progress 53 resupply ship redocked to the International Space Station’s Zvezda service module Friday at 8:13 a.m. EDT after a 48-hour venture away from the complex to enable Russian flight controllers to test its upgraded Kurs automated rendezvous system. The Progress moved to about 300 miles away from the station before beginning its return to the complex early Friday. 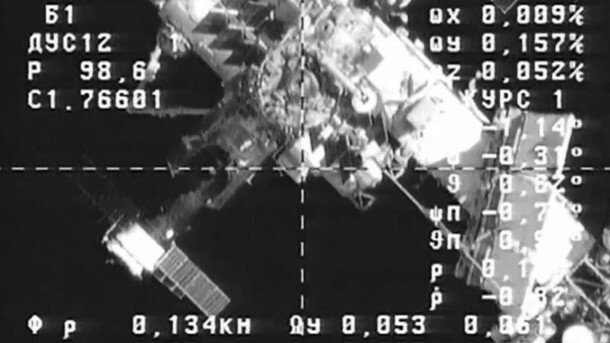 It undocked from Zvezda early Wednesday morning. The Progress 53 first arrived at the station last November, but an attempt to test the enhanced Kurs system was scrubbed when the rendezvous required the approach to be manually controlled by the crew because of a technical glitch unrelated to the Kurs system. There are currently five spacecraft docked to the International Space Station, including two Soyuz spacecraft, two Progress space freighters and one U.S. SpaceX/Dragon commercial cargo craft. The Progress 53 will undock for good on June 9 and will be deorbited to burn up in the Earth’s atmosphere. Next up are a pair of reboosts of the station on Saturday and next Tuesday using the ISS Progress 55 and Progress 53 thrusters, respectively, to place the station at the correct altitude for the scheduled return to Earth May 13, U.S. time, of Expedition 39 commander Koichi Wakata, NASA Flight Engineer Rick Mastracchio and Soyuz commander Mikhail Tyurin of the Russian Federal Space Agency in their Soyuz TMA-11M spacecraft. They will be replaced on board by a new trio of residents, Soyuz commander Max Suraev and Flight Engineers Reid Wiseman of NASA and Alexander Gerst of the European Space Agency, who will launch to the complex May 28, U.S. time, as part of the Expedition 40 crew. They will join NASA’s Steve Swanson, who by then will be the station commander, and Russian cosmonauts Alexander Skvortsov and Oleg Artemyev.